Applanix, a world leader in products and solutions for mobile mapping and positioning, has introduced a new and expanded portfolio of Marine georeferencing and motion compensation solutions designed to deliver best-in-class performance at a variety of price points. Taking advantage of Applanix proprietary technology, this new line-up of marine products offers high-performance solutions to a broader cross-section of the hydrographic survey industry. At the entry-level of the expanded product portfolio, Applanix introduced the new POS MV™ SurfMaster. Incorporating Applanix’s proprietary SmartCal™ inertial calibration techniques, POS MV SurfMaster delivers robust georeferencing for small platforms, both manned and unmanned. SurfMaster is fully supported by Applanix’ industry leading post processing software POSPac™ MMS, and can deliver roll and pitch accuracy to 0.03 degrees, regardless of latitude or rate of vessel motion. Applanix’ new marine product line-up also includes POS MV WaveMaster II and POS MV OceanMaster. Using newly developed inertial technology, POS MV WaveMaster II delivers performance equal to the well-established and proven WaveMaster E, but at a new lower price point. POS MV OceanMaster replaces the POS MV 320 E as the georeferencing and motion compensation solution of choice for the hydrographic professional, integrating next generation inertial sensors, which enable performance and pricing previously unavailable with this class of technology. POS MV OceanMaster provides reliable and robust surveying in even the most demanding sea conditions. POS MV Elite remains the ultimate option for those users seeking the very highest level of performance available to the industry. 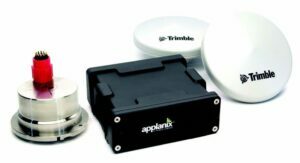 All Applanix Marine products benefit from the optimal integration of GNSS and Inertial observables, with access to Trimble® GNSS technology affording unique performance advantages. The new POS MV SurfMaster, POS MV WaveMaster II and the POS MV OceanMaster are available now worldwide through the Applanix sales channel.